Gionee has made a mark for itself in the Indian market. It has brought in many new features into the mobile market. This time it has come up with the Gionee F106 phone which has a whole lot of features packed in it. 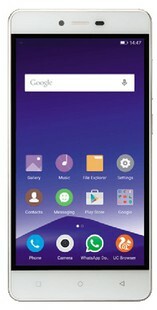 The Gionee F106 price in India is 9899 INR. There are not many negatives for this phone but it comes with Android 6.0 which is not the latest version of Android but that is the case with almost all the Chinese phones in the market today. This Gionee F106 budget phone has many good features being sold at a minimal price which should suit the best of the demands. The Gionee F106 mobile comes packed in a good body. The side bezels are kept to the minimum though not negligent. The lower bezel has the capacitive buttons and the upper bezel has the camera and the proximity sensor on the right and the left of the audio speaker. By the images doing the rounds on the internet, the rear camera is placed in the top left camera of the top bezel in the back. The LED flash is present on its right. Gionee has its logo imprinted a little above the middle of the back. The speakers are present on the lower bezel in the back. The Gionee F106 dimension are measured to be 162 x 20 x 2 inches ( 145 x 70 x 7 mm ) and weighs around 150gms which is quite light for a phone of this size. Gionee F106 display is a good 5 inches in size with a screen resolution of 1280 x 720 pixels. It has a pixel density of 294 ppi, a capacitive touchscreen with a TFT display and also supports multi touch feature. Gionee F106 camera features an 8MP rear camera and a 5MP front camera. This phone also supports video recording at 720 fps. The other features are Geo-tagging, Autofocus, Touch focus, Face detection, Voice Capture, Face Beauty and HDR. The Gionee F106 specifications include a 16GB of internal storage and it provides the customers with an option to increase it up to 128GB using a microSD card. The phone comes with a 2GB RAM. The Gionee F106 battery is a powerful 3000 mAh non-removable Li-ion battery. This powerful battery should suffice well for the features on this phone. The Gionee F106 features a Quad core processor with a Chipset of MediaTek MT6737. The frequency of the phone is measured at 1.2GHz with a GPU of Mali T720. Gionee F106 has a lot of impressive features including a vibrant display and a good camera. If you are looking for a phone priced around 10000 INR then you can rely on this. Take a better look at its features here . You can also compare it with phones in the same price range from Meizu, Gionee and Xiaomi. Gionee F106 full specs and reviews as of Apr 2019. Buy it here!